On the surface, the idea of a business voluntarily paying more money in taxes than it owes sounds absurd. But this is exactly what hundreds of businesses and commercial property owners in Georgia have chosen to do by forming Community Improvement Districts, or CIDs. CIDs are authorized by the Georgia Constitution as a mechanism for funding certain projects and services like street and road construction, landscaping, new parks, water and sewage systems, signage and wayfinding, and public transportation systems. A majority of the commercial property owners within the CID’s boundaries must vote to form the CID and be subject to its taxes, fees and assessments. So why, exactly, would business owners vote to tax themselves more? Because if the experiences of the more than 20 different CIDs currently operating in Georgia are any indication, the benefits of CIDs from an economic development standpoint can far outweigh the costs. In all, over the past 26 years Georgia’s CIDs have raised $463.8 million in total tax revenue through $1.75-billion’s worth of projects as of March 2014. Those figures don’t even take into account the intangible benefits of community building and sense of pride these projects instill locally. 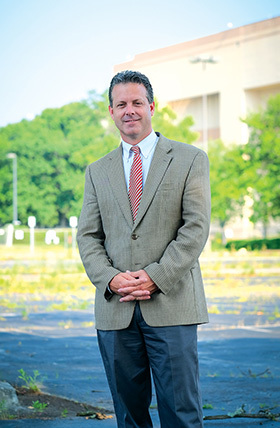 Emory Morsberger has been one of the main Metro Atlanta CID champions since he helped form the Highway 78/Evermore and Gwinnett Village CIDs a decade ago when he was chairman of the Gwinnett Revitalization Task Force. “We were looking for ways to turn areas around from an economic development standpoint and realized CIDs were one tool for doing this,” he says. Morsberger soon expanded his real estate development firm to include consultation services to help other Metro Atlanta areas form CIDs. This includes helping form and then serving as president of the Stone Mountain CID in 2011, and more recently helping form the Airport West CID. Among the improvements planned are better signage and wayfinding, landscaping interchanges, better coordination of security among the different cities in the districts, and improved overall branding and marketing of the airport corridor to prospective businesses. Specifically, Morsberger says a new diverging diamond interchange (DDI) is planned at the intersection of Camp Creek Parkway and I-285 to help ease congestion at this bottlenecked intersection. The Cumberland CID was the first CID established in Metro Atlanta way back in 1988. At the time, commercial real estate assets in the Cumberland area totaled $1.2 billion. Today, this number has more than doubled to $2.7 billion. Chairman Tad Leithead says the Cumberland CID has played a large role in this growth by helping encourage wise private-sector investment in public infrastructure in order to protect and grow property values. Since 1988, more than $105 million in private assessments has leveraged an estimated total investment in the Cumberland district of a half-billion dollars. The results of this investment can be seen in a total of 64 different projects, including 32 road improvement projects, 24 trails and streetscape enhancements, and six beautification initiatives. “These projects have helped support and protect commercial value,” says Leithead. Another $1 billion in investments is anticipated over the next decade through federal, state and local partners, he adds. Of course, the biggest recent coup for Cumberland is attracting the Atlanta Braves, who will relocate from downtown Atlanta to a brand-new, $1-billion ballpark and mixed-use facility on 60 acres of undeveloped land right in the heart of the Cumberland CID in 2017. In a strong show of support, the CID board and its investors made an upfront commitment of $10 million toward public infrastructure related to the Braves project. A new Cumberland Special Services Tax District created by Cobb County will assess an additional levy to help pay for the ballpark and related infrastructure. “This type of transformational development is why we have been investing in the community for more than 25 years,” says Leithead. Just around I-285 from the Cumberland district is another metro region that has benefited tremendously in recent years from the formation of CIDs: the Perimeter region. There are actually two Perimeter CIDs – the Fulton Perimeter CID and the Central (DeKalb) Perimeter CID – that operate as one. According to Yvonne Williams, president and CEO of the Perimeter CIDs, the funds collected by the Perimeter CIDs are used to leverage additional funding and expedite critical transportation infrastructure and quality of life improvements for businesses, employees, residents and visitors in the Perimeter market. Since they were formed in 1999, the Perimeter CIDs have committed more than $31 million and leveraged a total of more than $114 million toward a wide range of projects. One of the most significant is the DDI at Ashford Dunwoody Road and I-285, which was the first DDI constructed in Georgia when it opened in 2012. “It has been a major success in improving traffic flow at this congested interchange,” says Williams, who notes that the DDI has improved traffic conditions by 40 percent since it opened. The success of the DDI has led to the construction of at least six others in the Metro Atlanta area. “Through partnerships with the cities of Dunwoody, Sandy Springs and Brookhaven, as well as DeKalb and Fulton counties and multiple state, local and federal officials and agencies, the Perimeter CIDs are amassing a significant track record of improvements that are transforming the Perimeter market,” says Williams. A number of new projects are being planned or are in the works for the Perimeter CIDs. These include the creation of a series of pathways and trails that will connect corporate buildings to MARTA stations and amenities, improved access and signage throughout the Perimeter area, an inter-Perimeter circulator (small bus or van transit), and a new park on five acres of underutilized property that Williams says will serve as a central gathering place in the heart of the Perimeter. The Perimeter CIDs are also championing the proposed I-285 at Georgia 400 interchange improvement project. Moving up the Georgia 400 corridor, the North Fulton CID marked its 10-year anniversary last year by revamping its original Blueprint North Fulton master plan. “We had basically completed the first tier of projects in our original plan, so we created a new plan to take us through 2021,” says North Fulton CID COO Ann Miller Hanlon. Meanwhile, the last major project in the original Blueprint North Fulton plan will get underway later this year: construction of a new $10-million En-core Parkway Bridge that will replace the old bridge and connect the North Point Mall area with the Verizon Wireless Amphitheatre. It will feature sidewalks and landscaping and can be expanded to four lanes to handle traffic before and after concerts. “The current bridge is underutilized, so one goal with the new bridge is to attract more users and help ease congestion in the area,” says Hanlon, adding that the revamped bridge should open by the end of next year. But the biggest economic development news in North Fulton is the scheduled fall opening of Avalon, a giant mixed-use development at Old Milton Parkway and Georgia 400 that Hanlon says is the biggest mixed-use project currently under development in the entire country. She says the North Fulton CID is helping prepare the infrastructure and plan for the anticipated increase in traffic in the area. This includes building a new left turn lane at the Old Milton-Georgia 400 northbound exit that she says will be finished by the time Avalon opens this fall. Warbington is very excited about the new Atlanta Media Campus and Studios development at Jimmy Carter Boulevard and I-85. The mixed-use project centers around a huge film and television media complex. Several movies, most recently Insurgent, have already filmed at the studio, which is being developed by The Jacoby Group. Future plans include media production studios, emerging media and high-tech office space, and educational and research facilities along with housing, retail and an on-site hotel. A soon-to-be-completed DDI at the Jimmy Carter/I-85 interchange is expected to cut congestion by up to 50 percent, Warbington says. The Atlanta Downtown Improvement District (ADID), which is the CID for downtown, and the Midtown Improvement District, the Midtown CID, managed by Midtown Alliance, are both busy with a number of projects geared toward boosting economic development in their respective regions. The Atlanta Streetcar is one of the biggest recent downtown projects. The electric streetcar uses an overhead power system, much like the trolleys that ran through downtown Atlanta in the early 20th century. Phase One, 12 stops along a 2.7-mile loop connecting Centennial Olympic Park to the King Historic District, is scheduled to start operating by the end of 2014. While the Atlanta Streetcar is often associated with efforts to boost the appeal of downtown as a tourist district, “it’s as much about connecting people and improving mobility in the downtown corridor as it is tourism,” says Jennifer Ball, vice president of planning and economic development for Central Atlanta Progress, which manages the ADID. Formed in 1996, the ADID was the second CID in the metro area. At that time, it was more focused on making downtown clean and safe through initiatives like the Ambassador Force and Clean Team than it was on infrastructure improvements and economic development, says Ball. Today, it has played a role in helping land such high-profile attractions as the College Football Hall of Fame – scheduled to open Aug. 23 – and the recently opened National Center for Civil and Human Rights. Enhancements at the Five Points MARTA station are a current priority, Ball says. “It’s at the center of the MARTA rail lines and it’s the busiest MARTA station, but it’s not really very attractive,” she says. The ADID is also working with the Midtown Alliance and the Buckhead CID on the Atlanta Better Buildings Challenge – a coordinated effort to reduce energy and water consumption in office buildings and make these regions more sustainable over the long term. The goal is to reduce energy and water usage by at least 20 percent by 2020 in buildings participating in the challenge. Some downtown buildings are already ahead of this goal, as are several Midtown buildings, notes Kevin Green, president and CEO of Midtown Alliance. “Our focus is on creating a vibrant and active urban experience and a safe and welcoming environment,” says Green. Since 2000, more than $400 million in public and private funds has been invested to build streetscapes, bridges, roads and other improvements in Midtown, Green adds. This includes 14 miles of new sidewalks with more than 700 new streetlights, more than 800 shade trees, over 100,000 square feet of new median and plaza landscaping, three new public plazas and three new bridges. Green points to a number of new fully funded capital projects for Midtown that are in the planning and implementation stage. These include enhancements to the Peachtree Street Bridge, improved Peachtree Street streetscapes, upgrading of existing bike facilities and construction of new ones, and the Midtown Transportation Operations Program (MTOP) – a three-year project that is providing signal timing and equipment upgrades at 100 intersections in the area. Of the 22 CIDs in Georgia, all but two – Brunswick’s Turtle River CID and the Georgia Gateway CID in Kingsland – are in the metro Atlanta area. And all are extremely busy with projects on the horizon. The Tucker CID, which just formed in 2013, has already improved the I-285-Lavista Road area with a gateway project and recently annexed 67 Northlake commercial properties, adding $110 million in property value. The Town Center CID in Kennesaw helped bring the $27-million Big Shanty Connector and the $24-million Skip Spann Connector to fruition. Its most recent project, the seven-mile Noonday Creek Trail, is scheduled to open this month. The walking and biking trail connects the Town Center mall area to Kennesaw Mountain National Battlefield Park trail system and the proposed West Cobb Trail. Morsberger agrees that the future for CIDs in the Metro Atlanta area is very bright indeed. “More people are realizing that CIDs are good for city and county governments and they’re good for businesses and commercial property owners,” he says.